In the 48 hours since a series of airstrikes destroyed a Syrian Arab Red Crescent convoy delivering aid to the rebel-held west Aleppo countryside on Monday, both the Russian and Syrian governments have denied responsibility for the attack. The airstrikes killed at least 15 people, including the head of SARC’s Aleppo operations, Omar Barakat. On Tuesday, the United Nations, United States and International Committee of the Red Cross all initially described the incident as an airstrike. That, by extension, would likely implicate either the Syrian or Russian governments since opposition rebels do not operate aircraft. Aid truck destroyed in Monday airstrikes. Photo courtesy of the Aleppo Media Center. Abu Haitham, who recorded video of airstrikes hitting SARC aid convoy in Orem al-Kubra on September 19. He is a Thiqa Agency correspondent based in the west Aleppo countryside. We are not surprised by the United Nations’ amended statements. 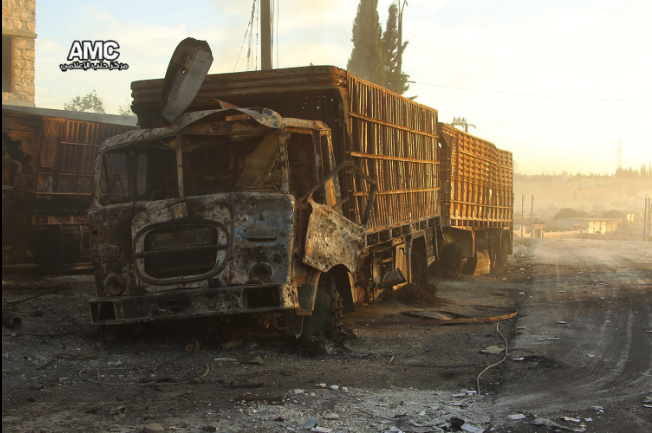 If the regime thought there was an international order capable of holding it accountable, then it wouldn’t have struck the [SARC] aid convoy in the first place. We recorded the initial moments of the attack on the convoy. The video showed that the strikes came from the air and included missiles, [helicopter] machine-gun fire and barrel bombs. Abu Leith, director of the Civil Defense Media Office in Aleppo. The Russian Ministry of Defense called the Syrian Civil Defense’s claims [regarding the airstrikes against the convoy] baseless. This is despite the fact that, in our video report, we displayed pieces of a barrel bomb at the scene of the strike. Firas Huriatani, citizen journalist based in the west Aleppo countryside. Since the bombing, the Russians have been publishing new statements every hour—each one contradicting the last. Then the UN came out to define the event as “attacks” rather than “airstrikes,” which paves the way for accusations that rebels were somehow responsible for bombing the SARC convoy. The United Nations’ amendment of its statement [to replace the word “airstrike” with “attack”] comes as no surprise. Every time the regime commits an atrocity, those in the UN respond with fiery statements. We used to think this meant that Bashar al-Assad was finished. But then the UN backs off its initial position and Bashar comes back to bomb us harder than he did before. We can draw a parallel with the East Ghouta attacks [of 2013], when the regime killed more than 1,000 people with chemical weapons. The initial responses from politicians and UN officials made us think that Assad was done. But there he is, three years later, sitting on his throne.